The AlcoMate AL7000 Premium breathalyzer is the newest of all breathalyzers that offers a field replaceable and pre-calibrated sensor module. The AlcoScan AL7000 (AlcoMate Premium) is suitable for health and law enforcement professionals, as well as individuals seeking for simply the best. 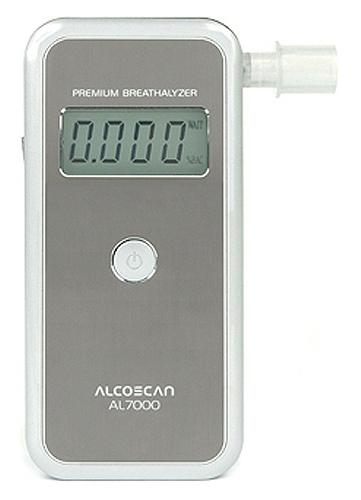 AlcoMate AL7000 breathalyzer is built in a manufacturing facility governed by ISO9000 quality standard and procedures to ensure the highest degree of product reliability. The AL7000 Field Replaceable Sensor Technology guarantees unit readiness in remote fields testing situations such as maritime and military applications. The Sensor module stores all calibration parameters in its non-volatile memory. The AL7000 sensor replacement has been further simplified by designing the sensor module in an accessible sensor chamber. Open the rear chamber door, pop the old one out and drop in a factory pre calibrated sensor. That simple! With the replaceable sensor technology, you always replace the old sensor with a factory calibrated fresh one. this will dramatically extend the life and usability of your device. The AL 7000 is the only breathalyzer in the market that offers factory calibration accuracy in the field without wasting time and money. AlcoScan AL7000 Premium offers pre-calibrated and field replaceable modules (patent-pending). One of the main problems with using breathalyzers in critical applications is that the alcohol sensor requires periodic re-calibration. Unfortunately, the re-calibration process requires that the breathalyzer be physically mailed or taken to a professional service center. The process is costly for both consumer and service center, and the delay of processing and shipping back-and-forth can be quite a loss. The Pre-Calibrated Replaceable Alcohol Sensor Module can eliminate the delays and complications of re-calibration by allowing a simply "snap out" an old module and "snap in" a new one. This way, you can get back to reliable and accurate testing in a matter of few minutes. Warm up time 45 sec.